When one is going to a warmer locale with winter legs, one panics and wants to do things one normally would never do. Please, remain calm and do not visit a random tanning place and get sprayed. There are too many unknown variables that could produce a frighteningly dark or orangeish hue. 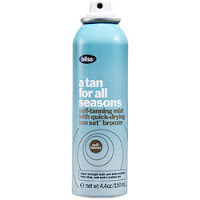 Control your color with a good self-tanning product from a reputable brand. Try Clarins at Sephora. They have a decent selection of self-tanners, with or without sunscreen, and for body, face or just legs. 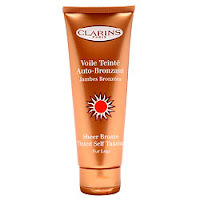 I bought the Sheer Bronze Tinted Self Tanning For Legs, $29.50, but I'm putting it on my arms too (will I be breaking a beauty commandment and turn to stone if I put the leg cream on my arms? I'll keep you updated). The tint is key, advice I got from Jean Godfrey-June in her book Free Gift with Purchase. * The beauty director of Lucky Magazine and a devoted self-tanner, she notes that the tint makes application much faster and effective as you can see what's going onto your skin. And she's right. Just remember the tint color is not going to be the color of your tan. And regarding that last tip, I was amazed at how quickly the Clarins dried. *buy this book for insider beauty advice. It's very entertaining and is a great holiday girlfriend gift.